Finding the best cell phone plan at just one cell phone company can be challenging, but trying to compare cell phone plans at all four major carriers -- with an estimated 10,000.000 rate plan combinations -- it's practically impossible. .
Thankfully, Billshrink makes it simple to compare cell phone plans based on how long you talk and the other features, like text and data that each line uses. 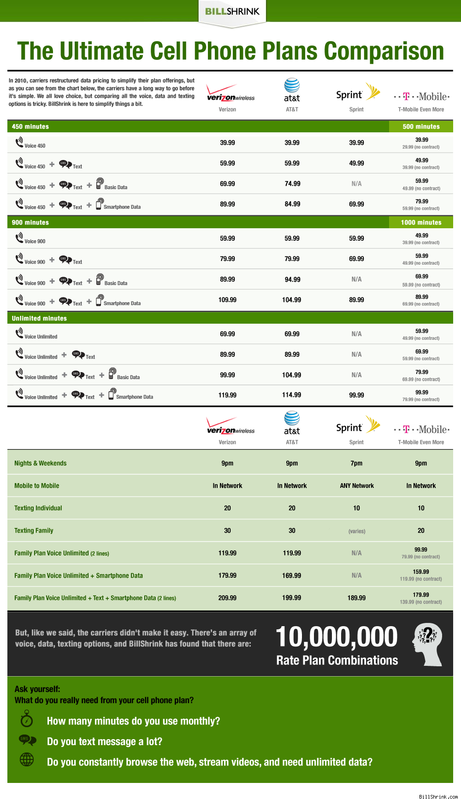 To help bring the magnitude of cell phone plan shopping down to a fathomable level, BillShrink has shared the Ultimate Cell Phone Plans Comparison infographic with WalletPop. This easy-to-follow image compares the costs of Verizon Wireless, AT&T, Sprint and T-Mobile at 450 minutes, 900 minutes and the unlimited plans as well as how much each plan costs with texting and data charges. 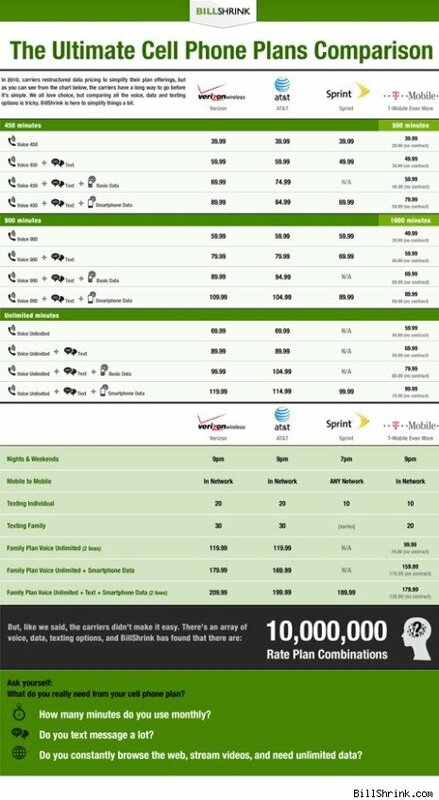 It even lets you see what the charges look like on a family plan, when nights and weekends start and more. For a personalized recommendation, you can use the BillShrink Cell Phone Adviser tool to find the best cell phone plan. The tool can connect directly to your current cell phone account and pull in your actual usage, or you can manually estimate your use. If you connect BillShrink to your account, the Bill at-a-glance feature gives you an easy-to-understand summary of your cell phone use for all lines tied to your account. Even if you aren't searching for a new plan you should check this out as it blows the reporting from my carrier out of the water in terms of ease of use. Can you hear me know Verizon? From there, BillShrink will look at Verizon, Sprint, AT&T and T-Mobile to figure out which plans on which carriers offer the best deals for your usage. You can sort by price, signal strength and "ShrinkScore" -- the amount your cell phone bill will shrink if you switch plans.